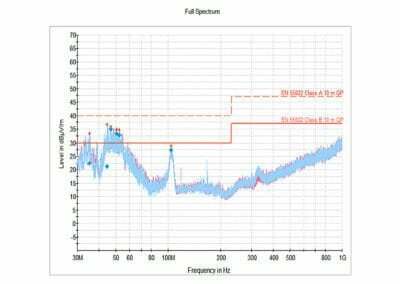 Case Study – EMI Filters in Application | EMI Solutions Inc.
Review of real-time applications and analysis for the filter selection process. 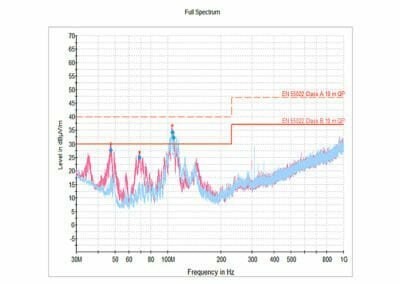 Let’s look at some real-time applications for EMI filters. Armed with this basic understanding of the field and the associated components, the next step is to look at some real-time applications and analyze the filter selection process from the perspective of a specialist in EMI. Notice the measured noise in a system versus the allowable limits as shown by the solid red line. 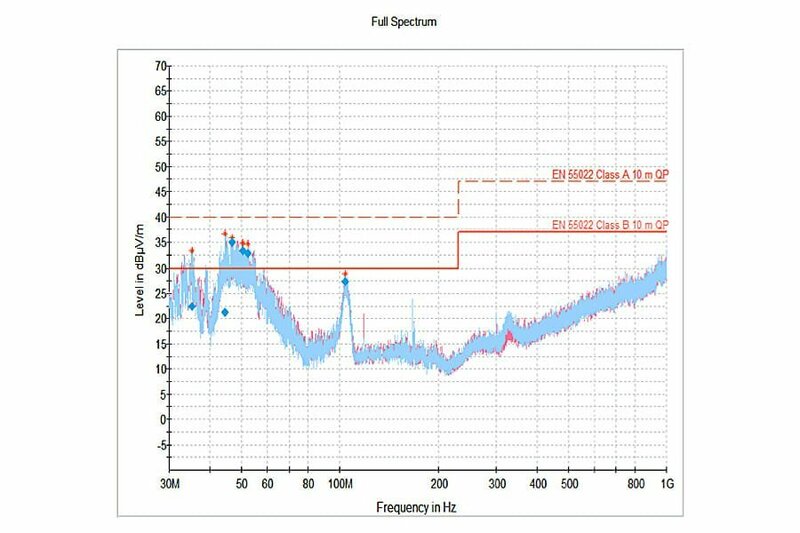 Figure 7 – Example of measured noise associated with a system without EMI filters. Figure 8 – Manufacturer supplied performance plot. 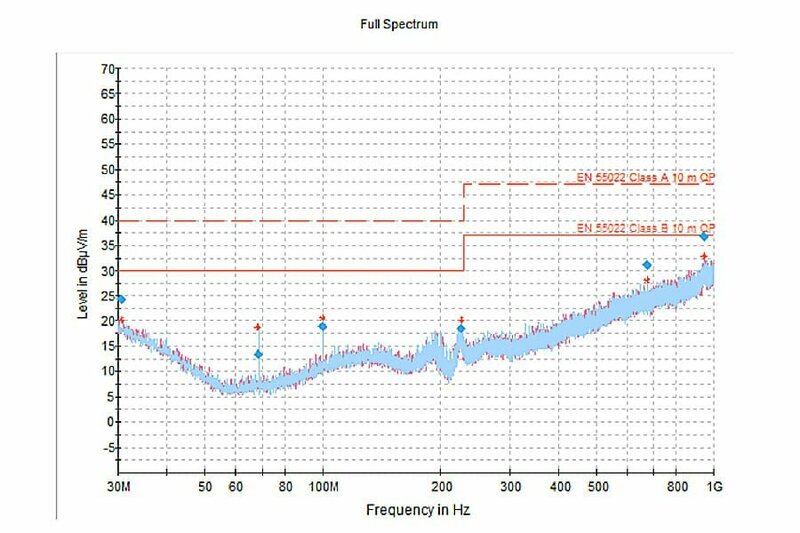 Consider the above plot to be a customer’s noise output measured with no EMI filters – this performance resulted in a costly production stoppage. 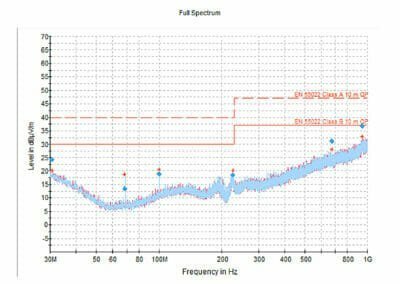 It is important to note that the frequencies between 30MHz and 70MHz exceed the allowable limit, meaning the design could not go to market regardless of the actual product’s success. The above area, even though this customer had a shielded enclosure, requires either an expensive design overhaul or additional filtering to reduce this noise to acceptable levels. The largest outage for this customer was at 39MHz, shown in Figure 8 with a green hash mark. 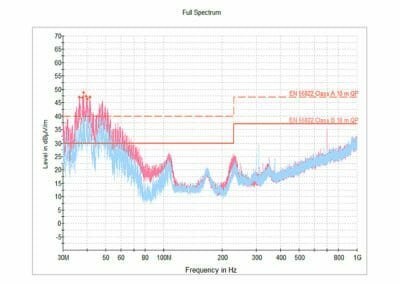 Based on this observation, it is necessary to select a filtered connector that will allow the “Low Frequency” data, in this case, below 1.0MHz, to be transmitted without compromise or degradation, while filtering out the high frequency noise in the system. Armed with this this information, coupled with reviewing the filter manufacturer’s performance data shown in Figure 9, it can be determined that filtering in the range of 10,000pF to 30,000pF is most likely the best solution for this application. Next, it is necessary to determine if a chip capacitor filter would be able to block the frequencies of concern, due to the low cost and high reliability of that type of filtering systems. With this in mind, the customer moves forward to test with two general system solutions, a 10,000pF capacitor filter insert and a 22,000pF capacitor filter insert. Figure 9 – The system from Figure 8 with 10,000pF capacitor filtering. This customer started the process by trying a 10,000pF Chip Cap press in filter. 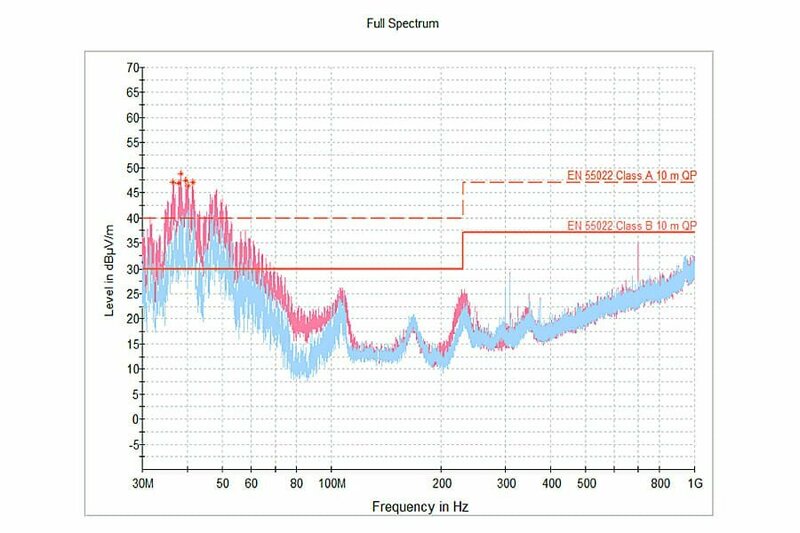 The results (shown in Figure 10) indicate that this device was acceptable in the upper frequencies but there was not sufficient filtering in the lower frequencies between 10MHz and 60MHz to bring the noise down below the allowable test limit. Figure 10 – The system from Figure 8, with a generic 22,000pF capacitor filtering. Next the customer tried a 22,000pF chip cap filter, attempting to adjust the maximum filter performance into the lower frequency area where the noise persisted. 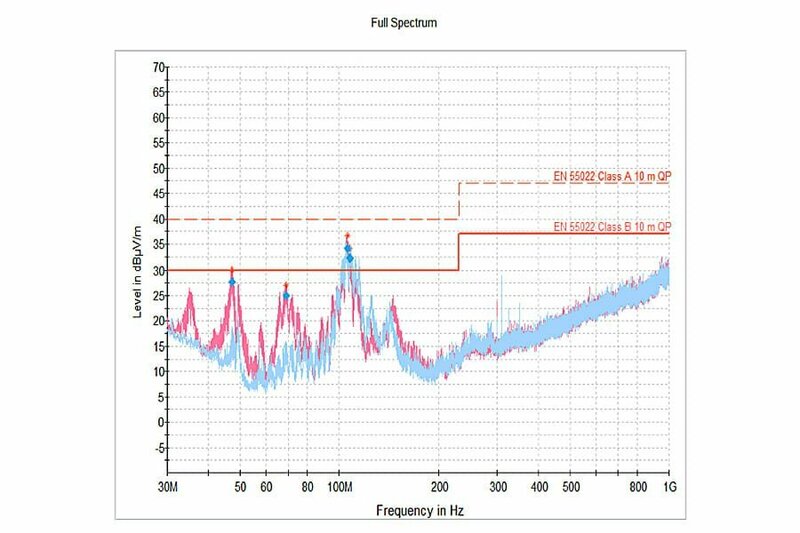 As seen (in Figure 11), performance improved, with only small spikes at or near the noise limit in the lower frequencies, but this filter caused “ballooning” of energy into the higher frequencies around 105MHz, exceeding the allowable limit. These test results helped the customer conclude that filtering was still required, but that the generic chip capacitor filter inserts did not provide sufficient filtering and would not fix the system without a more specialized approach. 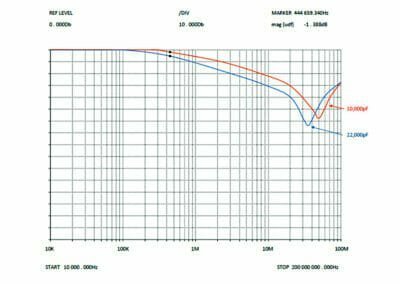 Next, the customer tested the EMI Solutions FlexFilter insert, built with maximum attention to the reduction of the equivalent series inductance. This is achieved by mounting the chip capacitor across an isolation channel separating the pad contact area from the signal pin and the solid ground plane. This design delivers maximum shielding effectiveness and minimizes the equivalent series inductance, providing the best possible performance available from the chip capacitor while capitalizing on the shielding already present within the system. 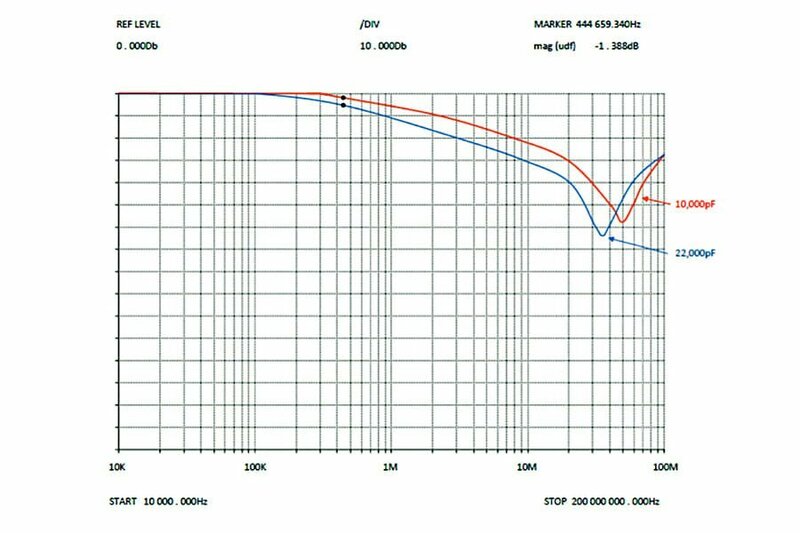 The customer, with the specialized 22nF or 22,000pF filter, achieved the results (shown in Figure 11), meeting EMC regulations with a cost effective long term solution. After considering the results of these tests, the customer decided to go with the better broadband filter (Figure 11, the specialized filter) as there was not a lot of margin in the higher frequencies where the chip capacitors provide minimal filtering. This specialized 20,000pF discoidal filtered connector, a C Filter built with discoidal capacitors which provide higher levels of filter performance as well as broader frequency performance. This design improves on the other filters above and even the one in the same capacitance by utilizing the shielding already present rather than attempting to filter the system as a “magic bullet” solution. It supplemented the parts of the system that were successful, enhancing the overall performance of the entire system, instead of treating the system as a separate entity. Figure 11 – The system of Figure 8 with a custom filter added.